Escape From Kathmandu is a collection of four short stories that are loosely connected. Three of the stories had been previously published; the collected volume was published in 1989. Because of the similar characters and setting in the stories, Escape From Kathmandu could be considered as a novel. "Escape From Kathmandu" is composed of four novella-length stories and could be considered a collection. However, all four stories have the same two leading characters, are arranged chronologically in the events they describe and each story somehow builds up from the previous one (in the latter two in particular), in terms of how the characters become aware of larger social problems in Nepal. As such, "Escape From Kathmandu" could also be considered as a novel. The stories are told in first person narration, travelogue-style (three of them by George, one of them (the third) by Freds). They involve a great deal of humor, often at the culture shock resulting from Westerners being immersed in an Asian culture, or from the (lack of) development of the Nepali administration of the time -- but never making fun of the Nepali people and their culture. Also, there are many fantasy elements: subjects covered include very real Buddhist practices, but also the mythical/crypto-zoological yeti, the mythical hidden kingdom of Shamb(h)ala/Shangri-La/Xanadu/Agharti and the associated mythical/crypto-historical underground network of tunnels connecting different places on Earth. The book opens with a quote by Alec Maclellan, from his 1982 book "The Lost World of Agharti". The stories take place concurrently to their writing, in the late 1980s, and are solidly anchored in Nepali history: references (and appearances!) are made to the Ranas, King Birenda, Nepali social movements, the development of Kathmandu and retired US President Jimmy Carter. The main characters are based in Thamel, a part of Kathmandu that was made popular as an "alternative" tourist district in the 1970s. At the time Nepal was a kingdom under King Birenda; it was so until the Nepali Civil War of 1996-2006, after which a Republic was established (even though Nepal still experiences political tensions and government overthrows). Bored on the off season in Kathmandu, George steals an unopened letter from his hotel and embarks on an adventure. He meets Nathan, a zoologist, and his friend Freds, both American expats and mountaineering enthusiasts. During a science trip in the Nepali highlands, Nathan made contact with the yeti! This event sprang an expedition to capture one of the yetis, an expedition headed by Phil, Nathan’s rival for the heart of Sarah, a beautiful ornithologist. George, Freds and Nathan realize that the yeti has been brought to Kathmandu and is to be smuggled to the USA in secret. The trio is joined by Sarah in the rescue of the yeti from Phil’s hotel, a rescue rendered difficult by the simultaneous visit by Jimmy Carter. The yeti, now nicknamed Buddha, proves to be very intelligent and human-like, even capable of weaving a necklace and utter “Namaste”, and overall a very nice fellow; Buddha comes to dress perfectly as a human, shake Jimmy Carter’s hand, assist George in cycling through the Kathmandu streets and be offered a baseball cap. While Freds lures their pursuers away, George and Buddha go on a bus and air trip in order to bring Buddha back to the wild. Over tea, George meets Kunga Norbu, a Buddhist tulku and Freds’ personal guru. George and his Sherpa Laure start guiding their team: four English trekkers and an American documentary filmmaker who is all over the place, Arnold. The English are lured in by Kunga and Freds’ stories that the lost bodies of two historic English climbers (Mallory and Irvine, who disappeared in 1924 while attempting to be the first ones to reach the top of Mount Everest) are being sought to be brought back in England -- a sacrilege for climbers! they should be left at their resting place in the Himalayas -- and Arnold jumps on the chance to film their quest. What Kunga didn't say is that before he can become a full lama, he has to accomplish a secret task: climb the highest mountain of the Himalayas. So George is pulled into events however he may try to resist, the Brits try to avoid the annoyingly pressing Arnold, they eventually find and bury the bodies, and Kunga, Freds and George end up climbing Mount Everest illegally and spend the night in the cold, experiencing Kunga's heat-releasing tumo technique. The group returns safely and pretend they didn't know where they were to the authorities, and the Brits destroy Arnold's incriminating (and voyeurist) tapes. Shambala, the mythical but very real secret Buddhist city (also known as Shangri-La), is in danger of being discovered because of a road development project underway that would flood the area with tourists. Freds alerts George who would have none of it, so Freds has to pull George into an almost perilous journey, involving less-than-comfortable bus rides and trekking in the Himal, close to the Nepal-China border, to Shambala -- which proves to be like any other Tibetan village. With time, George comes to care deeply for the people of Shambala and gets involved in assisting the local doctor with the children’s health and food problems (and tries to deal with gastric problems of his own). Back to Kathmandu, Freds and mainly George put all their forces in investigating who is behind the road development. George gets lost in an endless series of bureaucratic redirections, inefficiencies, obscure chains of command, political game-playing and general corruption. Completely exhausted, George has to give up. George and Freds then embark the Shambali on another plan: conduct simultaneous attacks on military garrisons on both sides of the border, and retreat through secret underground tunnels. The surreal attack leaves George in the hospital and as he recovers, the geo-political ramifications of his plan have Nepal, China and India accusing each other, ultimately resulting in the road project being cancelled and the Shambala valley saved. Since his last adventure, George has been very much pained by the poor situation the Nepali are in and was seeking the best way to help them. He is confronted to an impossible choice when two of his friends ask him his assistance. Because of his previous experience with the palace administration, Nathan and Sarah ask him to help them promote and finance a program of sewage works; this would have tremendous beneficial effects on Kathmandu sanitation. Freds asks him not to, and he has to reveal why: below Kathmandu, and in fact everywhere below Nepal and Tibet, lies a vast secret network of underground tunnels connecting significant Tibetan locales. A faction of the opposition's Congress Party, which hopes to subvert the corrupt Panchayat Raj government of the Ranas, eavesdrops on the Palace intrigues and cooperates with the Shambali. George has the idea to have this unified Nepali resistance movement condemn the tunnels that would intersect with the planned sewers and dig up new ones. The plan goes through safely, up until George can no longer cope with the Ranas’ corruption going on right on top of his head, and breaks through to the Palace and kidnaps the King. George, Freds and Bahadim end up being chased by Palace guards in the underground tunnels, all the way to an exit in the Nepali jungle. George Fergusson: An American expatriate in Nepal, George works as a mountain guide for “Take You Higher, Ltd.”, and when he doesn’t, he hangs around Thamel idly. In a difficult situation, everyone expects from him to be the one to come up with an ingenious plan. Hypochondriac and wary of all Nepali food. George "Freds" Fredericks: Used to study biology in the USA, became enamoured with the Buddhist culture and settled in Nepal. He is the Buddhist apprentice of Kunga Norbu, thanks to whom he has been let in to some of the secrets maintained by the Tibetan population. Buddha: a yeti in the Himalayas. He and his kin occasionally help the Shambali in case of need. Kunga Norbu: a climbing lama and a tulku, originary from Shambala. Disciple of Dorjee Lama, who set him out to accomplish a certain task before Kunga could become a guru of his own right: to climb the Everest. Practices tumo and lung-gom-pa.
Bahadim Shrestha: journalist for the Nepal Gazette, specialist of the inner politics of the Nepali Panchayat Raj and associated occult financing. Also, a secret member of the Nepali Congress Party. 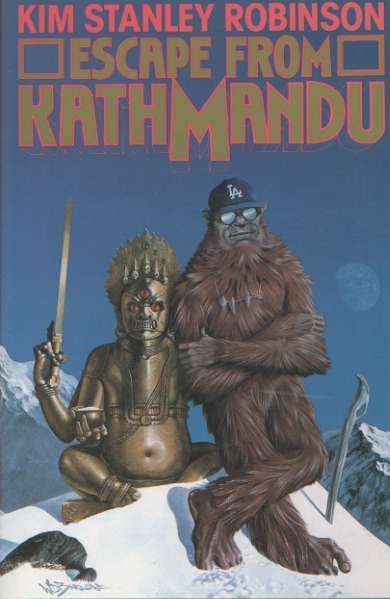 In chapter 13 of the first publication of Escape from Kathmandu in Isaac Asimov's Science Fiction Magazine (September 1986), Freds refers to "Buddhist guerrillas"; this was changed in subsequent printings to "Hindu guerrillas". In the first publication of Mother Goddess of the World in Isaac Asimov's Science Fiction Magazine (October 1987), Kunga Norbu's first incarnation is named Naropa, and Kunga Norbu's guru is named Tilopa. In subsequent printings, these names are changed to Tsong Khapa and Dorjee respectively.